Supernatural delivers the long awaited meeting between Jack and his father Lucifer as the Winchesters consider their options when it comes to helping those in the alternate universe. Much of this season has been focused on the notion of family which has been a recurring theme on this show since it began. What defines family is something that is commonly explored and given vastly different answers as Sam and Dean’s perception of it changes the more they experience. They are blood brothers and have a really strong bond that stems from there but isn’t entirely defined by it, Castiel is also considered to be their brother, Bobby was a surrogate father figure to them when he was alive and Jody serves as an alternate mother figure for them although their biological mother, Mary has been around for a couple of seasons and has a different relationship with them. It was recently mentioned that Charlie was like a sister to them and Jack became the closest thing they’ll probably ever have to a son. The point is that the definition of family is variable on this show and this idea extends to Jack who is face to face with his biological father for the first time. It is something that we have waited all season to see and this episode doesn’t disappoint. Jack is wary but curious about his father because all he has is stories told to him by other people who bring their own biases into what they tell him. The general consensus is that Lucifer is evil and great pains have been taken to keep him away from Jack to lessen the chance of his corrupting influence ruin what is fundamentally a good person. The nature vs. nurture debate comes into play through Jack with Sam and Dean’s influence helping him undertand the difference between right and wrong, at least as they see it. He brought those lessons with him into the alternate universe and made a conscious decision to help people and fight against the oppressive Angel regime. Now that Lucifer is in front of him the nature side of they debate finally has a place as Jack finally gets to meet the thing everyone feared he would become. Sam and Dean are naturally reistant to letting Lucifer anywhere near Jack because of the potential for Lucifer to corrupt him as he has so many others but Jack wants to hear his father out and make his own mind up. The interesting thing about this is that it’s easy to see where Sam and Dean are coming from considering their vast experience from Lucifer but they also have no right to prevent Jack from talking to his biological father. Castiel backs this position up through his own belief that Jack is Kelly Kline’s son, not Lucifer’s and his family are those that were there for him before as well as after his birth. This means that as far as Castiel is concerned, Jack’s family consists of himself, Kelly Kline, Sam, Dean and Mary with Lucifer being nothing to him. Once again it’s easy to see where Castiel is coming from given his personal feelings about Lucifer. Mary is the one to tell Sam and Dean that it isn’t their decision to make because it’s up to Jack to be presented with the facts and make up his own mind about who he wants to have a relationship with. She basically tells them that he’ll see what Lucifer is through his own eyes, not theirs and they should leave him to get to know Lucifer in his own way. 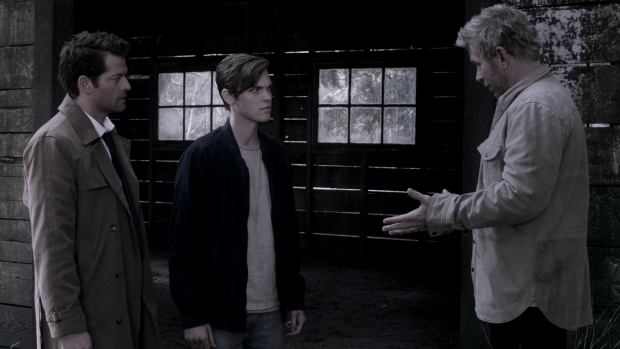 Lucifer and Jack’s interactions are excellent with great performances by Alexander Calvert and Mark Pellegrino. In terms of dialogue Jack has a lot less but conveys more through his facial expressions as his role is to hear Lucifer out to get a sense of where he’s coming from where Lucifer has to process the fact that he has a son he is now able to talk to and has to find the right words to say. The really interesting thing is that Lucifer seems genuine and makes his case well. Of course being manipulative is something he is well known for but Mark Pellegrino’s performance suggests that Lucifer does actually want a relationship with his son so he outlines his point of view on the way he was treated by God and makes a case for not being responsible for all the evil in the world. His approach is still a manipulative one because Lucifer doesn’t know how to be anything else but there’s a different flavour to this manipulation. He is trying to influence Jack into thinking that he deserves a chance to prove himself and that he isn’t as evil as he has been made out to be. The difference between this and his usual brand of manipulation is very subtle and down to the choices Mark Pellegrino makes as an actor as well as dialogue that suggests vulnerability on his part. Jack simply takes this in and doesn’t really make up his mind one way or another which makes sense given how overwhelming it would be as an experience. 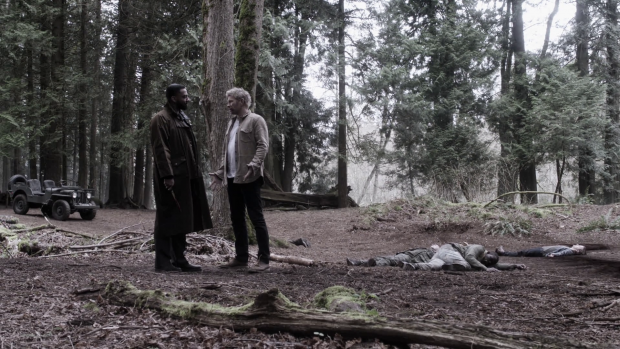 Lucifer gives Jack some insight into his biological family by introducing him to Gabriel, reminding him that Michael is also his Uncle and amusingly pointing out that God is his Grandfather. It gives Jack some context for where he came from and the cosmic forces that he is a part of. It carries a lot of weight and it’s clearly something Jack struggles to process because his experience is with a more Human outlook so the divine family connection would naturally be overwhelming. It will be down to Jack to decide what this means for him and I wonder if there will be any plans to explore his connection to whatever family Kelly Kline has. In Lucifer’s mind he is more misunderstood than evil and all of his behaviour is a consequence of God banishing him from Heaven for telling the truth about how flawed Humanity are. There’s some truth to that though he did go to extreme lengths to prove his point and there’s definitely more to it than he says. His conversation with Gabriel confirms that by having Gabriel tell him some important home truths that he is denying himself. It’s a really good conversation that feels like it comes from a familial background. Gabriel is able to call Lucifer out on the narrative he has created because he has known him for as long as the universe has existed and understands what his flaws are. His actions had a lot to do with being jealous that God loved Humanity more than him and he couldn’t handle that so lashed out in really terrible ways. Gabriel’s perception is that he will end up doing something similar with Jack because he has never changed no matter how much he has deluded himself. It’s a very complex family struggle that isn’t easily resolved and feels so much more compelling as a result. There are some fun surprises in this episode such as the reveal of alternate Castiel who is a renowned torturer and is sporting a bizarre German accent. It feels a bit cheap to have him inhabit the same vessel his counterpart does but it allows Misha Collins to have some fun hamming up his role. Having “our” Castiel use a similar interrogation method is a nice quick touch that reinforces the idea that alternate Castiel is a darker version of the one we know. Unfortunately Castiel’s duplicate is dispatched far too quickly with lots of potential that will now apparently never be explored. Still, Cas stating that he prefers Humans to Angels before delivering the death blow is a really badass one liner. The willingness to self sacrifice appears throughout in various forms. Mary is willing to stay behind because she believes in the cause that she has become a part of and wants to see the people of their world reclaim it from the tyrannical rule of the Angels. She has effectively found an extension to her family and wants to through it through rather than abandoning them. It’s a noble sentiment and nicely in keeping with the values held by Sam and Dean. Sam’s idea if bringing everyone back with them to regroup, better arm themselves and return with a plan allows for the best of both worlds and lets the cause grow in a really interesting way. It makes sense that Sam would be uncomfortable looking the other way when it’s possible to help especially with someone he cares about involved. Gabriel is another example of effective self sacrifice. 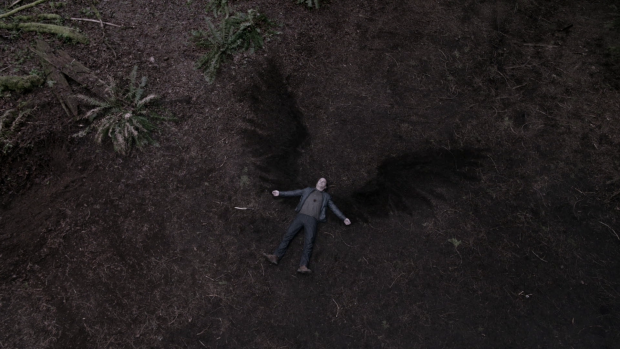 A recent episode was focused on getting Gabriel to a point where redemption was possible for him. The whole point of the episode was for him to realise that he had been running for too long and had to actually fight for something. His actions in this episode are the end result of that as he selflessly takes on Michael despite knowing that it will likely result in his death. This marks the completion of his arc from coward to hero and does so that works well in context. 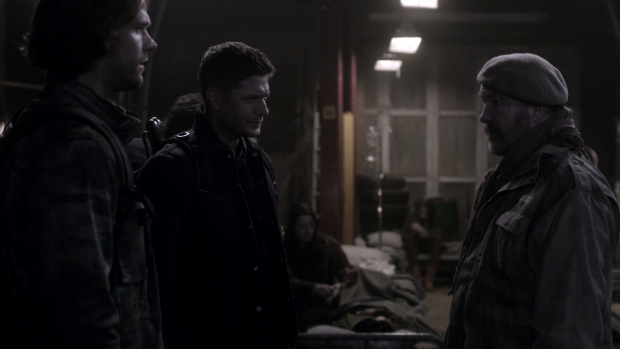 His sacrifice allows Sam and Dean to escape while raising the stakes for them as they lose a significant resource. At this point I have no idea what the finale will be about next week. 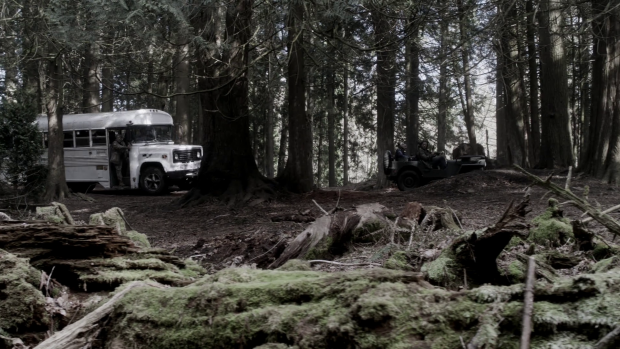 Outside of the setup that Michael and Lucifer might work together to get back to “our” universe in order to take over. Sam leaving Lucifer behind is a cathartic gesture on his part as he has been looking for revenge on Lucifer for a long time but it could also prove to be a costly mistake now that Lucifer appears to have turned against them. Of course it’s always possible that Lucifer is playing Michael so that he can return home; he is used ambiguously enough in this episode to make his next move unclear. The migration of a fairly large group of people between universes presents some interesting potential. For one thing we have a new Bobby and Charlie that are rife for exploration. There are enough similarities to make them feel familiar enough which mean’s that Bobby’s declaration of Sam and Dean being part of his family fully resonate but clearly key differences such as their different approach to recreation hinted at in the discussion. It’s a good move as it allows familiar characters to return while letting the writers deliver a different spin on them. As for how they will be used and what next week will bring I couldn’t even begin to speculate but there’s a lot set up for an excellent finale. Lucifer allies himself with Michael…or does he? An excellent episode that focuses on family as the central theme and explores it in different ways. Sam and Dean’s changing definition of family is at the heart of the show and has been applied to Jack this season. Similarly Mary has found a new family in the freedom fighters she now works with. The main thrust of this idea is around Jack and Lucifer who have some really compelling scenes together where Lucifer tries to make a case for being misunderstood in a really broad sense and attempts to justify his behaviour since the beginning of time. Mark Pellegrino’s performance is still attempting to be manipulative but in a very different way as he seems to genuinely want a stable relationship with Jack though his conversation with Gabriel suggests that he’s delusional and incapable of changing. It’s a complex situation because Jack is trying to make up his own mind and adjust to the divine family connections he has when he has been used to a more Human outlook. The episode does a good job of moving the plot forward complete with some surprises in the form of a badly underused alternate Castiel and two examples of noble self sacrifice with Mary being willing to stay to fight the good fight. The other comes from Gabriel who completes his redemption arc and dies as a hero who allows everyone to escape while removing a powerful resource from Sam and Dean’s arsenal. Lucifer offering to help Michael could be an example of him being back to his old tricks which sets up Sam’s revenge driven decision to leave him to die at Michael’s hand as a costly mistake but he could also be playing Michael to get himself back home. Lucifer is handled with enough complexity in this episode to allow strong arguments either way. At this point I have no idea what the finale will bring but there is lots of potential for development with new versions of the familiar Bobby and Charlie characters. What happens next week is anyone’s guess at this point and that’s a good thing as far as I’m concerned.